.NET Core 3.0 is representing a major step for the .NET community. It is interesting to analyze what’s new in the API directly from the compiled bits. In this post I will first explain how to diff .NET Core 3.0 against .NET Core 2.2 with NDepend, and then how to browse diff results. Arguably the biggest progress of .NET Core 3.0 will be the support for Winforms and WPF on the Windows platform. Since everything is new here, compare to .NET Core 2.2, we won’t analyze this part. However it will be interesting to analyze .NET Fx Winforms/WPF APIs vs .NET Core 3.0 Winforms/WPF APIs in another post (that I finally wrote here). It takes a few minutes to download NDepend trial, install it and start VisualNDepend.exe, and it takes a few minutes to compare .NET Core 3.0 against .NET Core 2.2. If you want to browse the diff on your machine, expect 5 to 10 minutes to get hands-on. Respectively 156 and 161 assemblies are gathered. Click Ok to run two analysis, on older and newer build. Both analysis results will be then diffed automatically. Member = x.IsMember ? x.Name : " "
It is interesting to just focus on the 297 new public types with the code query below. Download the list here or browse the same list at the end of this post. It is also interesting to browse the new 1.101 public methods and 38 public fields added on public types that existed already in .NET Core 2.2. Download this list here. NDepend proposes 6 default rules to browse API breaking changes. Exploring the API evolution is useful for API consumers. For those working on the framework .NET Core itself, it is interesting to also browse implementation changes. The NDepend search by change panel proposes various options for that. Note that this search panel is actually a code query generator. The Edit query button proposes to edit and refine the currently generated query. Another interesting point is that it is a semantic implementation change. All matched methods do behave differently at runtime. This makes this tool ideal to plan code change review without bothering with formatting and comments change. Matched code elements can be highlighted in the metric view. From the screenshot above we can see at a glance that System.Xml and System.Data are much more stable than System.RunTime for example. By zooming in the view, we can get more information about which code was churned. In the query result panel, a code element is underlined when its implementation changed. If you have compiled both source versions on your machine and analyzed those compiled versions, you can right click an underlined method and directly compare the diff in source code. I hope you see value both in the results offered and in the how-to-diff procedure that can be applied to any .NET code base, assuming you have 2 versions to compare. Here is the list of the 297 new types added to .NET Core 3.0. This morning I stumbled on a complex test to write. The need was to create and show a custom Form (written with Windows Form) that relies on the System.ComponentModel.BackgroundWorker to do initialization stuff without freezing the UI. The test is complex because after creating and showing the form, it must wait somehow to release the UI thread for a while to let the BackgroundWorker achieve the RunWorkerCompleted on the UI thread. I know that this is something we’ve done in the past and I know this is tricky enough to not reinvent the wheel. But with a test suite of over 13.000 tests this is quite challenging to find where we did that. So I decided to use NDepend querying facility to search. Let’s refine this query to match all methods that create any of those form classes.This could be achieved by iterating over (all methods) x (all form classes), but the NDepend.API extension method ThatCreateAny() acts like a join and operates in a linear time. For our search scenario, waiting a few seconds to get a search result is not a problem. But for a code rule written with CQLinq, this is important to run it as fast as possible in a few milliseconds, to run all queries and rules often in Visual Studio within a few seconds, hence the query performance entry on the documentation. Still 122 test methods matched. In the source code of the highlighted test I had everything I needed for my scenario, including a link to a tricky stackoverflow answer that we found years ago. I found what I needed within a few minutes and had a bit of fun. I hope the methodology and the resulting query can be adapted to your advanced search scenarios. Yesterday evening I had an interesting discussion about the feasibility of migrating parts of the NDepend code to .NET Standard to ultimately run it on .NET Core. We’re not yet there but this might make sense to run at least the code analysis on non Windows platform, especially for NDepend clones CppDepend (for C++), JArchitect (for Java) and others to come. Then I went to sleep (as every developers know the brain is coding hard while sleeping), then this morning I went for an early morning jogging and it stroke me: NDepend is the perfect tool to assess some .NET code compliance to .NET Standard, or to any other libraries actually! As soon on my machine I did a proof of concept in less than an hour. The key is that .NET standard 2.0 types and members are all packet in a single assemblies netstandard.dll v2.0 that can be found under C:\Program Files\dotnet\sdk\NuGetFallbackFolder\netstandard.library\2.0.3\build\netstandard2.0\ref\netstandard.dll (on my machine). A quick analyze of netstandard.dll with NDepend shows 2 317 types in 78 namespaces, with 24 303 methods and 884 fields. Let’s precise that netstandard.dll doesn’t contain any code, it is a standard not an implementation. The 68K IL instructions represent the IL code for throw null which is the method body for all non-abstract methods. new IMember // Here c.IsField and a field is not using anything! The result looks like that and IMHO it is pretty interesting. For example we can see at a glance that NDepend.API is almost full compliant with .NET standard except for the usage of System.Drawing.Image (all the 1 type are the Image type actually) and for the usage of code contracts. For a more intuitive assessment of the compliance to .NET Standard we can use the metric view, that highlights the code elements matched by the currently edited code query. portions of NDepend.Core non compliant to .NET Standard are well defined (and I know it is mostly because of some UI code here too, that we consider Core because it is re-usable in a variety of situations). With this information it’d be much easier to plan a major refactoring to segregate .NET standard compliant code from the non-compliant one, especially to anticipate hot spots that will be painful to refactor. There is no limit to refactor this query to your own need, like assessing usage of non-compliant code — except UI code– for example, or assessing the usage of code non compliant to ASP.NET Core 2 (by changing the library). Hope you’ll find this content useful to plan your migration to .NET Core and .NET Standard! We like extension methods. When named accordingly they can both make the caller code clearer, and isolate static methods from classes on which they operate. But when using extension methods, breaking change can happen, and this risk is very concrete, it actually just happened to us. ///Provides a set of extension methods dedicated to enumerables. ///Append <paramref name="element"/> at the end of <paramref name="seq"/>. We expect support on this within the next weeks and months when more and more users will run the .NET Fx v4.7.1 while not changing their rules-set. There is no lesson learnt, this situation can happen and it happens rarely, this shouldn’t prevent you from declaring and calling extension methods. The more mature the frameworks you are relying on, the less likely it’ll happen. NDepend v2017.3 has just been released with major improvements. One of the most requested features, now available, is the support for analyzing .NET Core 2.0 and .NET Standard 2.0 projects. .NET Core and its main flavor, ASP.NET Core, represents a major evolution for the .NET platform. Let’s have a look at how NDepend is analyzing .NET Core code. NDepend recognizes the .NET profile, .NET Core 2.0, for this application. It resolves several folders on the machine that are related to .NET Core, especially NuGet package folders. It resolves all 77 third-party assemblies referenced by MusicStore.dll. This is important since many code rules and other NDepend features take into account what the application code is using. It is worth noticing that the .NET Core platform assemblies have high granularity. A simple website like MusicStore references no fewer than 77 assemblies. This is because the .NET Core framework is implemented through a few NuGet packages that each contain many assemblies. The idea is to release the application only with needed assemblies, in order to reduce the memory footprint. NDepend v2017.3 has a new heuristic to resolve .NET Core assemblies. This heuristic is based on .deps.json files that contain the names of the NuGet packages referenced. Here we can see that 3 NuGet packages are referenced by MusicStore. From these package names, the heuristic will resolve third-party assemblies (in the NuGet store) referenced by the application assemblies (MusicStore.dll in our case). Let’s be clear that NDepend v2017.3 can also analyze .NET Standard assemblies. Interestingly enough, since .NET Standard 2.0, .NET Standard assemblies reference a unique assembly named netstandard.dll and found in C:\Users\[user]\.nuget\packages\NETStandard.Library\2.0.0\build\netstandard2.0\ref\netstandard.dll. By decompiling this assembly, we can see that it doesn’t contain any implementation, but it does contain all types that are part of .NET Standard 2.0. This makes sense if we remember that .NET Standard is not an implementation, but is a set of APIs implemented by various .NET profiles, including .NET Core 2.0, the .NET Framework v4.6.1, Mono 5.4 and more. Let’s come back to the MusicStore application that references 77 assemblies. This assembly granularity makes it impractical to browse dependencies with the dependency graph, since this generates dozens of items. We can see that NDepend suggests viewing this graph as a dependency matrix instead. The NDepend dependency matrix can scale seamlessly on a large number of items. The numbers in the cells also provide a good hint about the represented coupling. For example, here we can see that 22 members of the assembly Microsoft.EntityFrameworkCore.dll are used by 32 methods of the assembly MusicStore.dll, and a menu lets us dig into this coupling. Clicking the menu item Open this dependency shows a new dependency matrix where only members involved are kept (the 32 elements in column are using the 22 elements in rows). This way you can easily dig into which part of the application is using what. We saw how to browse the structure of a .NET Core application, but let’s underline that all NDepend features now work when analyzing .NET Core applications. On the Dashboard we can see code quality metrics related to Quality Gates, Code Rules, Issues and Technical Debt. Also, most of the default code rules have been improved to avoid reporting false positives on .NET Core projects. We hope you’ll enjoy using all your favorite NDepend features on your .NET Core projects! NDepend is a tool that helps .NET developers write beautiful code. The project was started in April 2004. It is now used by more than 6 000 companies worldwide. In more than a decade, many decisions were made, each with important consequences on the code base evolution process, sometime good consequences, sometime less good. Relentlessly dog-fooding (i.e using NDepend to analyze and improve the NDepend code base) helped us a lot to obtain more maintainable code, less bugs, and to improve the tool usability and features. Sometimes the team just needs a fraction of a library and it may be more cost-effective, and more maintainable with time, to develop your own. Sometimes the licensing of a free or commercial library will prevent you from achieving your goals. Sometimes the library looks bright and shiny but becomes an obsolete project a few months later and precious resources will have to be spent maintaining others code, or migrating toward a trendy new library. Sometimes the library code and/or authors are so fascinating that you’ll be proud to contribute and be part of it. NDepend has also relied on DevExpress WinForm for almost a decade to improve the UI look and feel. NDepend is a Visual Studio extension and DevExpress WinForm makes smooth visual integration with Visual Studio. Concretely, thanks to this library we achieved the exact same Visual Studio theming and skinning, docking controls a la Visual Studio, menus, bars and special controls like BreadCrumb to explore directories. We have never been disappointed with DevExpress WinForm. The bugs we reported were fixed quickly, it supports high DPI ratio and it is rock solid in production. NDepend has relied on MSAGL for several years to draw all sorts of graphs of dependencies between code elements including Call Graphs, Class Inheritance Graphs, Coupling Graphs, Path and Cycle Graphs… This library used to be commercial but nowadays OSS. Here also the bugs we reported were fixed quickly, it supports high DPI ratio and it is perfectly stable in production. NDepend used to have a C# Code Query LINQ editor in 2012, a few years before Roslyn became RTM. We wanted to offer users a great editing experience with code completion and documentation tooltips on mouse-hovering. At that time NRefactory was the best choice and it proved with the years to be stable in production. Nowadays Roslyn would certainly be a better choice, but since our initial investment NRefactory still does the job well, we didn’t feel the need (yet) to move to Roslyn. While there are libraries for licensing, these are vital, sensitive topics that require a lot of flexibility with time, and we preferred to avoid delegating it. This came at the cost of plenty of development/support and significant levels of acquired expertise. Even taking into account that these efforts could have been spent on product features, we still don’t regret our choice. The licensing layer is a cornerstone in our relation with our users community and it cannot suffer from any compromise. As a side remark, several times I observed that the cost of developing a solid licensing layer postponed promising projects to become commercial for a while. As most of application, NDepend persists and restores a lot of data, especially the large amount of data in analysis results. We could have used relational or object databases, but for a UI tool embedded in VS, the worst thing would be to slow down the UI and make the user wait. We decided only optimal performance is acceptable for our users, and optimal performance in persistence means using custom streams of bytes. The consequence of this decision is less flexibility: each time our data schema evolves, we need to put in extra effort to keep ascendant compatibility. I underline that most of the time it is not a good idea to develop a custom persistence layer because of the amount of work and expertise required. But taken account our particular needs and goals, I think we took the right decision. I explained here about our production logs system. We consider it an essential component to making NDepend a super-stable product. Here also, we could have used a third-party library. We capitalize on our own logging system because, year after year, we customized it with a plethora of production information, which was required to help fix our very own problems. We kept the system lightweight and flexible, and it still helps us improve the overall stability and correctness of our products. These UI components were developed years ago and are still up to date. Both then and now, I believe there is no good third-party alternative that meets all our requirements in terms of layout and performance. A few times, we received propositions to buy those components, but we are not a component provider and don’t have plans for that. In this post I unveiled a few core choices we made over the years. We hope this information will be useful for other teams. Recently, I posted about how the new version of NDepend lets you compute tech debt. In that post, I learned that I had earned a “B” out of the box. With 40 minutes of time investment, I could make that an “A.” Not too shabby! In that same post, I also talked about the various settings in and around “debt settings.” With debt settings, you can change units of debt (time, money), thresholds, and assumptions of working capacity. For folks at the intersection of tech and business, this provides an invaluable way to communicate with the business. But I really just scratched the surface with that mention. You’re probably wondering what this looks like in more detail. How does this interact with the NDepend features you already know and love? Well, today, I’d like to take a look at just that. 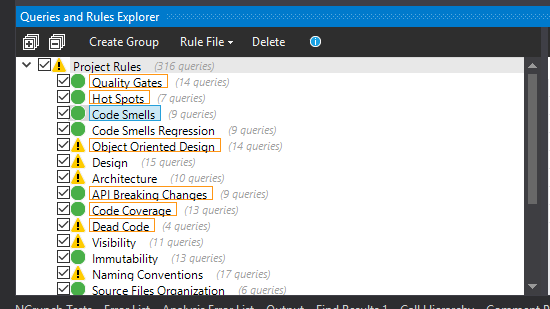 To start, let’s look at the queries and rules explorer in some detail. Take a look at this screenshot, and you’ll notice some renamed entries, some new entries, and some familiar ones. In the past, “Code Smells” and “Code Regressions” had the names “Code Quality” and “Code Quality Regression,” respectively. With that resolved, the true newcomers sit on top: Quality Gates and Hot Spots. Let’s talk about quality gates. If you’re familiar with NDepend, you’re probably familiar with the Visual Studio plugin, the out of the box metrics, the excellent visualization tools, and the iconic Zone of Uselessness/Zone of Pain chart. These feel familiar to NDepend users and have likely found their way into the normal application development process. NDepend has other features as well, however, some of which I do not necessarily hear discussed as frequently. The NDepend API has membership in that “lesser known NDepend features club.” Yes, that’s right — if you didn’t know this, NDepend has an API that you can use. You may be familiar, as a user, with the NDepend power tools. These include some pretty powerful capabilities, such as duplicate code detection, so it stands to reason that you may have played with them or even that you might routinely use them. But what you may not realize is the power tools’ source code accompanies the installation of NDepend, and it furnishes a great series of examples on how to use the NDepend API. NDepend’s API is contained in the DLLs that support the executable and plugin, so you needn’t do anything special to obtain it. The NDepend website also treats the API as a first class citizen, providing detailed, excellent documentation. With your NDepend installation, you can get up and running quickly with the API. Probably the easiest way to introduce yourself is to open the source code for the power tools project and to add a power tool, or generally to modify that assembly. If you want to create your own assembly to use the power tools, you can do that as well, though it is a bit more involved. The purpose of this post is not to do a walk-through of setting up with the power tools, since that can be found here. I will mention two things, however, that are worth bearing in mind as you get started. If you want to use the API outside of the installed project directory, there is additional setup overhead. Because it leverages proprietary parts of NDepend under the covers, setup is more involved than just adding a DLL by reference. Because of point (1), if you want to create your own assembly outside of the NDepend project structure, be sure to follow the setup instructions exactly. I’ve spoken so far in generalities about the API. If you haven’t already used it, you might be wondering what kinds of applications it has, besides simply being interesting to play with. Fair enough. One interesting use case that I’ve experienced personally is getting information out of NDepend in a customized format. For example, let’s say I’m analyzing a client’s codebase and want to cite statistical information about types and methods in the code. Out of the box, what I do is open Visual Studio and then open NDepend’s query/rules editor. This gives me the ability to create ad-hoc CQLinq queries that will have the information I need. But from there, I have to transcribe the results into a format that I want, such as a spreadsheet. That’s fine for small projects or sample sizes, but it becomes unwieldy if I want to plot statistics in large codebases. To address this, I have enlisted the NDepend API. One of the things that has surprised me over the years is how infrequently people take advantage of custom code metrics. I say this not from the perspective of a geek with esoteric interest in a subject, wishing other people would share my interest. Rather, I say this from the perspective of a business man, making money, and wondering why I seem to have little competition. As I’ve mentioned before, a segment of my consulting practice involves strategic code assessments that serve organizations in a number of ways. When I do this, the absolute most important differentiator is my ability to tailor metrics to the client and specific codebases on the fly. Anyone can walk in, install a tool, and say, “yep, your cyclomatic complexity in this class is too high, as evidenced by this tool I installed saying ‘your cyclomatic complexity in this class is too high. '” Not just anyone can come in and identify client-specific idiosyncrasies and back those findings with tangible data. But, if they would invest some up-front learning time in how to create custom code metrics, they’d be a lot closer. Being able to customize code metrics allows you to reason about code quality in very dynamic and targeted terms, and that is valuable. But you might think that, unless you want a career in code base assessment, value doesn’t apply to you. Let me assure you that it does, albeit not in a quite as direct way as it applies to me. Custom code metrics can help make your team better and they can do so in a variety of ways. Let’s take a look at a few. I can still remember my reaction to Linq when I was first exposed to it. And I mean my very first reaction. You’d think, as a connoisseur of the programming profession, it would have been, “wow, groundbreaking!” But, really, it was, “wait, what? Why? !” I couldn’t fathom why we’d want to merge SQL queries with application languages. Up until that point, a little after .NET 3.5 shipped, I’d done most of my programming in PHP, C++ and Java (and, if I’m being totally honest, a good bit of VB6 and VBA that I could never seem to escape). I was new to C#, and, at that time, it didn’t seem much different than Java. And, in all of these languages, there was a nice, established pattern. Application languages were where you wrote loops and business logic and such, and parameterized SQL strings were where you defined how you’d query the database. I’d just gotten to the point where ORMs were second nature. And now, here was something weird. But, I would quickly realize, here was something powerful. And now, all of a sudden, an object oriented language could be declarative. I didn’t have to write loop boilerplate anymore!